A:I had been following a lot of fashion blogs before I started my own back in 2010. I've always had a big interest in fashion, I loved dressing up as a kid and would put on different outfits and make my mum take pictures of me :) I really admired all those fashion bloggers who had started out with small blogs and worked their way up to being really successful and I knew that was something I wanted to do. So one day I just decided to go ahead and start one of my own and I definitely don't regret that decision. I've had great success with the blog for the past two years. At first I was really shy about it, hardly told anyone about it and cut my head of all the outfit pictures! But as I got more readers and the number of daily visitors started rising I gained more confidence about it. Today I'm super proud of my blog and how far I've come. A: I mostly get inspiration from magazines and other fashion bloggers and I have a few that I follow daily. 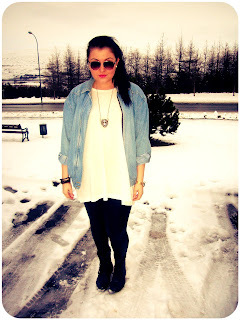 I really like the Scandinavian style and my two favorite bloggers come from Sweden. I recommend you check them out, Angelica Blick (http://nyheter24.se/modette/angelicablick) and Victoria Törnegren (http://victoriatornegren.se). They're so inspirational and I love their style. I always try to put my own spin on trends though and make sure my personal style shines through. I guess it also depends on my mood. Some days I just want to wear something comfortable and effortless and then others I like to dress up more and put on a bright lipstick and heels. I always try to stay true to my style though. A:I guess my style is kinda rock and roll chic with a mix of vintage. I have a very broad sense of style and it can change from day to day. I think it's important to experiment with clothes and not be afraid to try something new. A lot of people are too afraid to were something a little out of the ordinary and then judge you for doing it. I get a lot of that from Icelanders. Fashion should be fun and my advise is never say you would never wear something because chances are it will come back into fashion! A:I love stores like H&M, Primark and Gina Tricot which is a Swedish brand, where I can get fashionable item at a low price. But I also love stores like Topshop and Zara and second hand stores. You can find some really great items in second hand stores and usually at a really great price. I love mixing vintage items with new ones. A:My favorites are Alexa Chung, Rihanna and Kate Moss because they have very relaxed styles but very chic at the same time. I'm really into that casual chic look. I think it's awesome when people are like really over the top and are able to pull it off, like Lady Gaga, but I like people who seem like they can just throw whatever on and make it look effortless. A:Currently I'm just focusing on my university studies (I'm studying psychology) but I'm also working part time at Accessorize. However I'm planning on dropping out of school after this semester to go study to be a stylist and then a make up artist. I'm really excited about that! A:I think it's a tie between jackets and t-shirts. I'm slightly obsessed with blazers and my boyfriend keeps telling me I have way to many. I think a nice jacket or a blazer can do so much for an outfit and I like getting them in pretty colors. I'm currently searching for the perfect white blazer! But I also love how a fun t-shirt can pop up an outfit. I usually buy more basic items like that than fancy dresses and such.